While teaching social studies and the intricacies of past and current events can be complex, creating your lesson plan need not be. From famous leaders to events that shape history to government, legislation, and cultural norms, few subjects tackle the breadth of human experience as social studies does. Even for teachers, tackling social studies can be overwhelming unless you’ve got a clear-cut plan for yourself and your students. This is where a lesson plan, customized for you and your teaching style, comes in. Creating a DIY lesson plan need not be difficult. Canva’s intuitive interface makes it easy for you to create an easy-to-read roadmap for your classes. There are already ready-made templates you can simply edit as much or as little as needed. You’ve also got an amazing library of images, design elements, icons and illustrations at your fingertips to help you stay on top of each lesson. 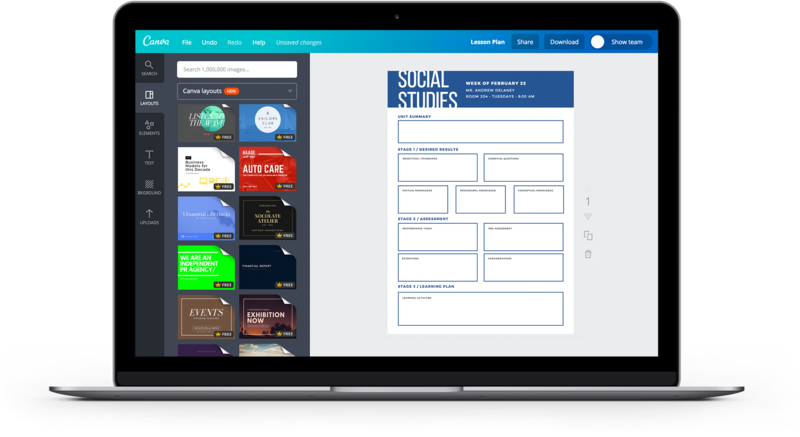 Create a new Canva account to get started with your own social studies lesson plan designs. Teaching a class as important as social studies should be pleasant for you so you can educate your students better about vital information like the branches of the government, the history of democracy or the capital cities of the world. If you want to create a beautifully designed lesson plan to aid you during class but don’t know how to start the solution is simple: Use Canva’s templates! Our amazing team of professional designers have taken on the bulk of the work for you, creating brilliant layout and templates revolving around various themes and topics. The best part is, our templates are completely free to use and reuse. If you want to spend a bit of money on special elements, images or illustrations, you can, because you’ll never have to pay more than $1 for each one-time use. Once you get started on a lesson, you can all too easily get distracted by questions or other topics that crop up. Make sure you don’t get sidetracked from important activities by constantly referring to your lesson plan. Most of our templates follow a structure that divides a lesson into parts—introduction, lesson objectives, guided practice, assessment, conclusion and next steps. By dividing your lesson into clear grids and blocks, you are better able to plan out the amount of time you need to spend on a certain topic, helping to maximize your time in class better. Of course, you need not follow this exactly if you’ve got a different teaching style. That’s the great thing about designing in Canva—everything’s completely customizable. Move, add or delete elements like images, icons or illustrations. Play around with font types, colors and sizes. Some subjects can definitely take longer to get through than others—it would be hard to explain the difference between democratic, parliamentary, monarchical, and autocratic governments in a few words. If you’ve run out of space, you can always add a new page to your design. Just click on the button at the bottom of the layout to add as many pages as you need. Canva supports up to 30 pages in one design. Do I need to purchase the lesson plan templates? Designing lesson plans in Canva is free! Our library of layouts have been created by awesome designers, making it as simple for you as a few clicks to create a professional design. If you use your own images in your design, the entire process will be free. Can I edit my social studies lesson plan after I’ve saved it? You can edit and save your designs as many times as you like. Every time you create a new collage it will appear in the “My Designs” section of your Canva homepage. You can also use a previously saved design and turn it into a template for your next lesson plan. Simply open the original design then click File on the menu bar and select Make a copy. This will duplicate the first design into a new file. How can I add more pages to my lesson plan? Sometimes one page won’t be enough to contain your whole lesson. To add more pages, simply click on the grey ‘+Add new page’ button below your design which adds a blank page. Or, to duplicate a page, click on the ‘Copy this page’ button (shown as two overlapping rectangles) found to the right of your design. You can add up to 30 pages to a design.